This is a fun board book with cut-out holes that takes you on a rhyming guessing game. As you can see from the cover, the usual "Peek-a-boo" is substituted first by "Peek-a-who/hoo" for an owl peeking through. As you turn each page, you discover another rhyme and another surprise popping through the cut-out, such as Peek-a-Zoo, Peek-a-Choo Choo. I have to say, Mikko adores this book even more than Alrik at this point. I like how the cut-outs give little ones something tactile to handle as you read, and the very last page, Peek-a-YOU, is a mirror, which always brings a smile. I love you when you're bashful and hide behind my knee. I love you when you're brave and from my arms you flee. No matter what the pup does (even if he's tangling her knitting or being wild or silly or angry), the same text resounds: "I love you." Ok, I'm seriously tearing up while writing this. The rhyming can be a little clunky at times (the above quote is a good example, with the inverted "from my arms you flee" to make the rhyme), but Mikko doesn't notice, and Alrik certainly doesn't. 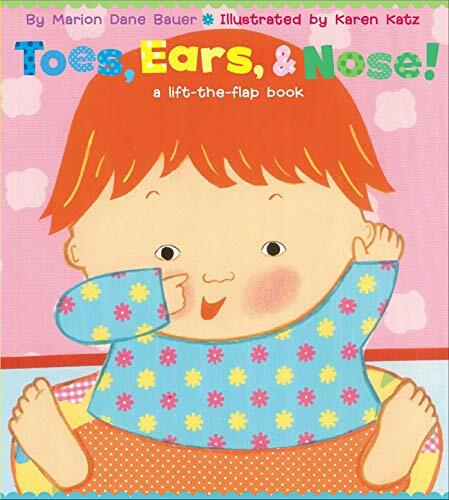 I also like that this type of board book has the softer, squishy (but still paper) cover, which again gives little kids something tactile to enjoy and won't be as abrasive against their mouths if they gum the book. I'm not sure if that's the same kind at Amazon (I imagine so) and the library (possibly not), but if you check it out in a bookstore, you'll see what I mean. It's kind of padded. 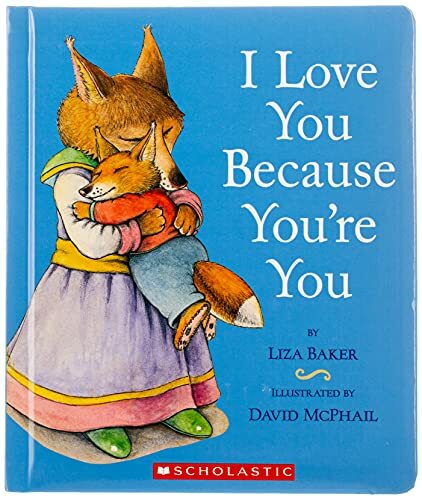 A baby we used to babysit for loved this book and memorized the "la la la" part with us, which charmed us no end. I knew we needed a copy when we had our own babies. 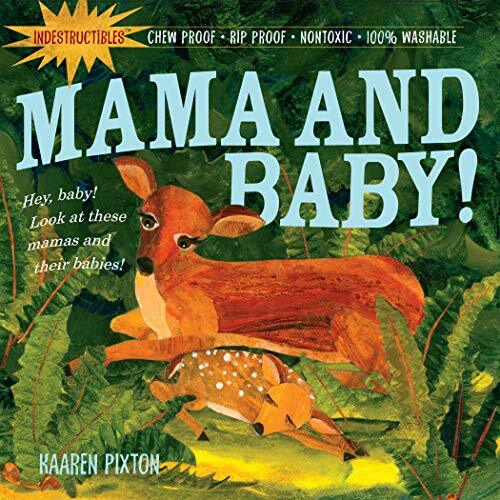 This is just a simple animal-sounds book but with Sandra Boynton's characteristic quirkiness. 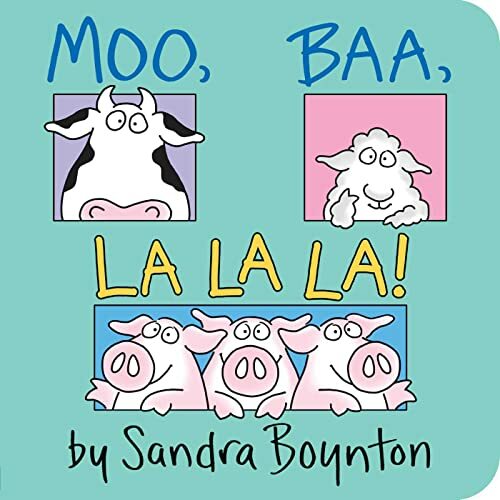 The "la la la" is what three singing pigs say, until the text corrects the overenthusiastic narrator and points out that all they really say is "oink." I love lift-the-flap books. Yes, you have to be a little careful around babies if you don't want any of the flaps to be ripped right off, but it's such a fun surprise to see what's underneath. This one is a guessing game of body parts and includes some more unlikely terms, like knees and elbows. It also shows a rainbow of skin tones. This can be a fun makeshift bilingual book, to teach signs for body parts or to incorporate those words from another language you and your child speak (or wish to speak). I love having touch-and-feel books around for babies. Can you tell I like the tactile properties of books? We have this one, though they've changed the cover, along with some others. Are you tired of hearing me say that you can also use it to teach animal signs or the names of animals in a different language? Well, you can. This one's just in the realm of possibility — I saw these at our local kids' store and was intrigued. The book is printed on the type of sturdy paper used to make shipping envelopes (like the U.S. Priority Mail ones). They're called Indestructibles, because they're unrippable and babies purportedly can safely chew and mangle them with no lasting damage. I've been wanting to get my own grabby little paws on one. Has anyone tried them out who could offer a title recommendation? Other titles in the series include Flutter! Fly! about things with wings, Wiggle! March! about plodding creatures, and Creep! Crawl! about, naturally, creepy-crawlies. I don't know if this is a plus or minus, but the Indestructibles books I mentioned, as far as I can tell, have no words at all. I guess that means they're more for looking at than for reading. The good news is, once again, you can use any language or words to talk with your little one about the pictures. What good books does your baby like to gnaw on (and/or read)? Davis got three of the indestrucables for Christmas, but I've only read one of them so far, to Moira. She was really into it, despite the lack of words. We love "Mama Do You Love Me" and the companion "Papa Do You Love Me." Very similar to "I Love You Because You're You." They've been a big hit for a long time, but the pages are a bit easy to pull apart. We have a couple of the "indestructibles" and we are all sort of meah about them, the illustrations are a bit too muted for DS's taste and they were a tad hard to manipulate when he was at the truly destructive to books phase (around 9 months or so)...but Moo, Baa, La, La LA! That's a keeper. I like some of the Boynton books but the ones I don't like I REALLY can't stand ("dinosaurs good, dinosaurs bad" in Dinosaurs and the "ugly" pajamas in Pajama Time are language choices that both bother me). Doggies makes me insane to read, but DS loves it. Mutual favorites in our house include "Everywhere Babies" (nursing and baby wearing both make appearances in the illustrations as well as families of all designs! ); "Goodnight Gorilla" is frequently requested as well. I would also recommend "Planting a Rainbow" with its easy to turn pages. The "That's Not My..." series of touch and feel books is also often requested. We love books in our house...and it's interesting to me how my favorites are not necessarily my darling son's! Love all of those. At one point they were all staples in our reading time, although I had children that were rough on the lift-the-flaps books, so those were never a favorite of mine. We read lots of Eric Carle, Maurice Sendak, and Dr. Suess too. We have hundreds of children's books though and we were always exploring the library too. @Shannon Hillinger: I love the Mama Do You Love Me books, too. Beautiful. I'll have to check out the Chuck Murphy ones! Mikko loves books that do things. @Joy: I've found Boynton books are hit-or-miss for a lot of folks. We love Everywhere Babies and Goodnight Gorilla as well! I'll have to check out Planting a Rainbow and the series you mentioned. @Brenna @ Almost All The Truth: When I bought a lift-the-flap book when Mikko was a baby, my mom was all like, "Hrm. Don't let him touch that." She must have had rough readers, too. :) I just waited till he was old enough not to tear it to pieces, though I don't mind a bit of wear. Having gotten some used from thrift stores, though, I know children vary in their tolerance for gentleness…we'll see what Alrik's like! Ah, Sendak as well, yes! Have you seen the recent interviews with him on The Colbert Report? He's as much a character as I figured he'd be. I love him. My boys loved Peek-A Who. We also read Ready Set... by the same author. Same style of book. They would read them over and over until they were just too worn to read anymore. Thanks for featuring books for our youngest ones! I have been looking for some board books for my 10-month old, but so many blogs just focus on books for toddlers and pre-schoolers. You've inspired me to discuss our favorite board books in the coming weeks, and to check these suggestions out! Perfect book list for little ones, my boys have a few of these and they love them!! We have Flutter!Fly! & Creep!Crawl! and my youngest(almost 10 months)absolutely adores them, and has since he was only a few months old. He's spent ages crumpling them up, throwing them around, chewing on them, and even sometimes enjoying the pictures, lol. We make up stories to go along with the beautiful illustrations, the lack of text doesn't bother us in the least. My daughter(three)also really likes them.